We are a full service creative arts company that specializes in all creative services unique to your special event! We have been creating memorable events for over 12 years and have a very talented team of artists. Very experienced, timely, fun and professional service. We do any theme for any party as well. Our clients include the San Diego Chargers, Intuit, Qualcomm and San Diego Symphony. Contact us with what you would like. 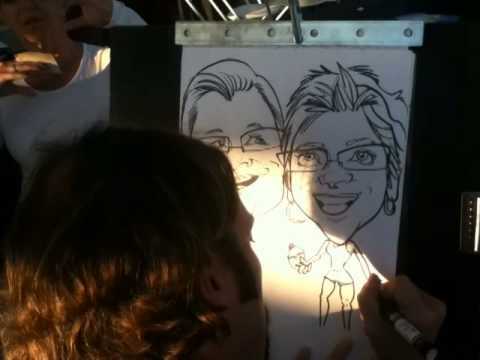 We hired Amusement Artists for our festival of 10k + people and they were great to work with! Elizabeth was so helpful and gave us a discount since we were needing to hire multiple artists. We will definitely be reaching out to them again next time we're in the area! Can’t wait for the 4th annual Heroes 6K in in SD! We’re always glad to have them!! Wonderful to work with! Very disappointing. We had to use a lot of our own materials, and I had to run out to the store to purchase more socks. The materials that were provided were things we all have at school. I will never book this event again. I had to give a rating, but really don't want to allow any stars at all for this. You had said socks would be donated by the parents and so I thought you would have extra for all the classes. If you were disappointed you could have told me in person rather then even writting a bad review. The kids really liked it! She was accommodating of our changing schedule and showed up with everything she needed. 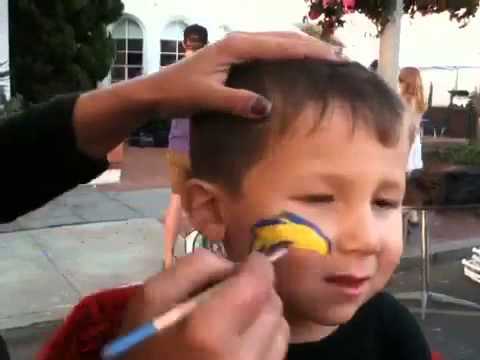 The signs drew the kids over and everyone had a great time getting their face painted. I would definitely book her again. Kids and Adult loved it!!! The kids loved!!! The artist was amazing! she did an amazing job and is great with the kids! Thank you!! We had a great time entertaining!! Elizabeth was prompt and professional. Did a great job at my daughter's 10th birthday doing henna tattoos and face painting. Will definitely use them again! First, I asked to bring Ariel and Elsa got here...second,n completely disorganized asking me what to do..... she could not control the kids, not entertained enough for the kids to stay and do activities..
Amusement Artist is an excellent company to work with. The artist was timely, skilled, and very professional. I would definitely hire her again. 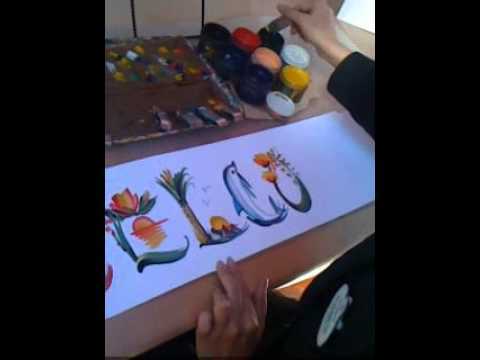 Thank you, Amusement Artist for making our event extra special and memorable for our clients. The guys with Amusement Artist were great! They created a wonderful atmosphere of entertainment and art that added a family fun twist to our business client event. A happy artist will arrive and set up unique to your event. We provide samples of he work and lots of fun designs to choose from! 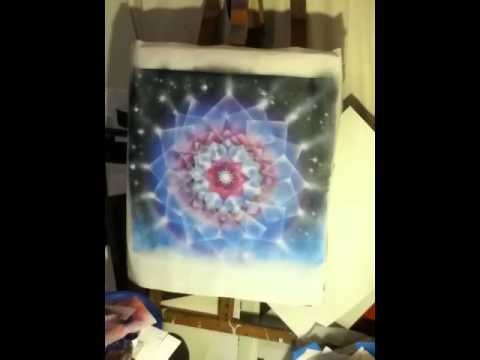 A unique piece of original artwork everyone can take home to remember your special event. 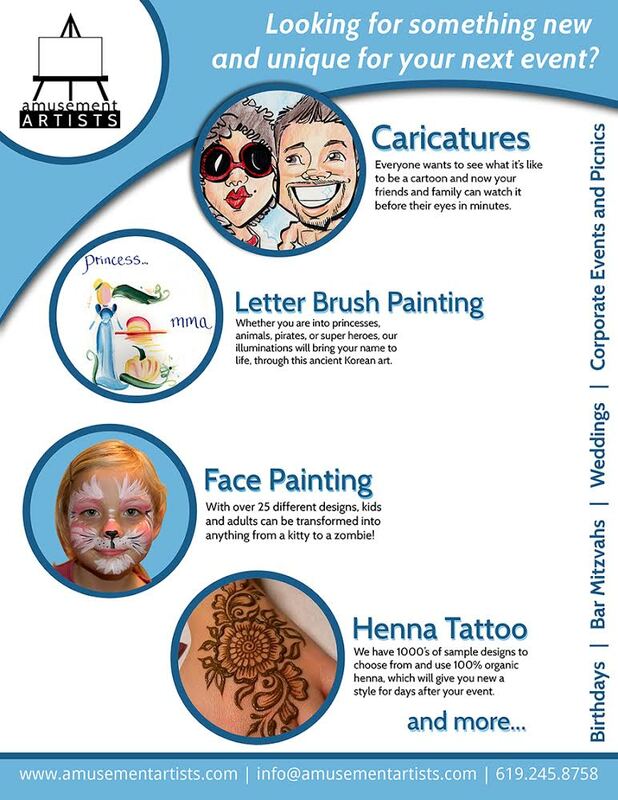 Our company does face painting, letter brush painting, henna and caricatures for any event. Background includes art teacher in public and private schools, fine artists and fun personalities! We have been painting for over 10 years, very experienced.